The Book Life: Blog Tour: Angel Eyes by Shannon Dittemore + Giveaway! 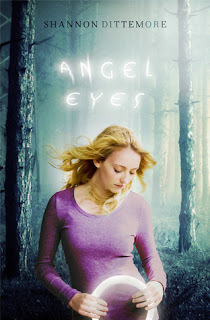 Blog Tour: Angel Eyes by Shannon Dittemore + Giveaway! Brielle comes back to her home town after the death of her best friend. She's having a hard time dealing with life, because she doesn't understand why someone like her friend was taken so soon. I really liked Brielle as a character, she was just a girl trying to deal with her pain and guilt about what happened to her friend. Jake is the new guy at school and he is definitely interested in Brielle. He is there just at the right time for Brielle, because she really needs someone she can count on while she is trying to understand and grieve her loss. I like multiple POVs in paranormal stories and I was glad to see that Angel Eyes had them. I feel like you get to see deeper into what is going on in the world, when you see it through more than one characters eyes. I liked that the story here wasn't exactly like so many other angel stories out there. It's not just about Brielle finding out she's an angel and having to deal with what that means, there are twists and other factors that kept it interesting. And the cold, I was so curious about the cold. Unfortunately, there were a couple of things that made this book less of a hit for me. I'm not really a religious person, but I can appreciate the angel/demon lore and really enjoy reading about it. The thing that pulled me out of the story a little with this one, were all of the religious undertones and Brielle's struggle with God. I understand the point that it served and it wasn't like it was preachy or out of place in the story, but it's not really for me. Overall I thought Angel Eyes was a really interesting take on angels and demons, and there was enough mystery swirling around to keep me turning the pages. This book may not be for everyone, but there is a great story here and Shannon Dittemore has done a wonderful job telling it. And now, for one lucky winner, I've got an ebook copy of Angel Eyes up for grabs! I so appreciate your kind and honest review, Sarah. Means so much that you would take time out of your schedule to feature Angel Eyes. I appreciate it more than I can say. And your site is awesome. I love the sheet music!